What exactly are shoppable posts and how to get your product into the "explore" section? Instagram has transformed from your ordinary social network into a powerful marketing tool within a couple of years. Every day business owners are coming up with new and creative ways to reach their target audience and boost sales while maintaining the entertaining tone of the platform. With 800 million active users during 2017, according to CNBC, Instagram is becoming one of the most popular social networks in the world. Such an inflow of users creates an incredibly attractive pool of potential customers for those savvy businesses that know how to wrap their head around innovation. Our guide to smarter Instagram marketing will help you create an integrated social media marketing strategy that will increase engagement to boost leads and sales. In response to brands actively promoting their image and products on the platform, Instagram introduced new shopping features for businesses in 2017 and this year it has expanded the availability of the new feature to 46 countries. So, what exactly are shoppable posts and how do you get your product into the "explore" section? 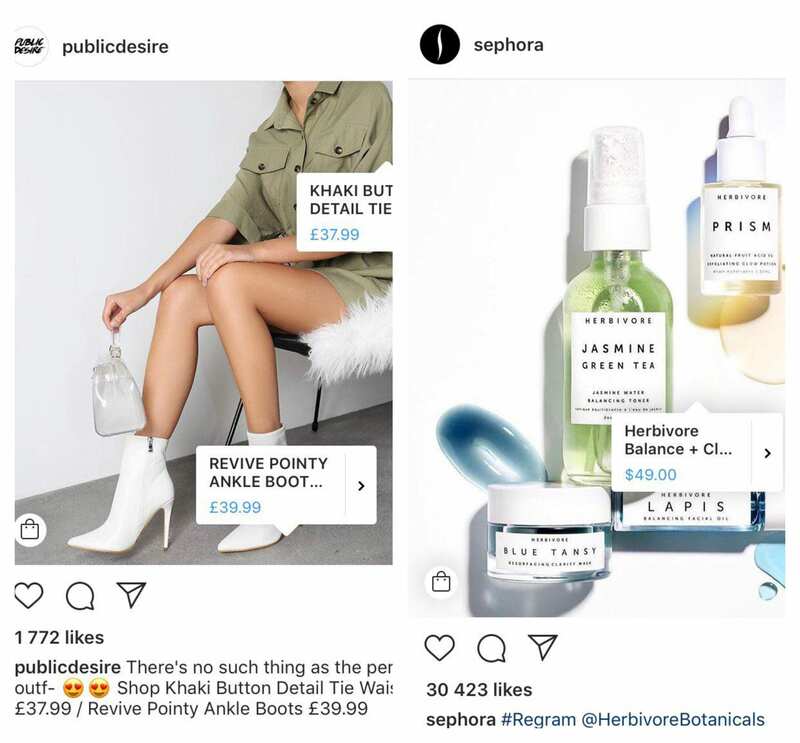 The new and unique shopping experience, introduced by Instagram in 2017, was implemented in the most organic way for the platform - in a form of shoppable posts with tagged products. Now businesses (and businesses only) can tag the products on their photos using the same process as you would when tagging a person. The only difference is that a photo with a tagged product will have a small shopping bag icon in the left corner, indicating there are tagged products, which can be clicked on to take the viewer to the brand's site. You also cannot tag a person and product in the same post. As Savannah Boysen, the marketing manager at TYME, stated, the "traffic from Instagram has increased 44% since implementing shopping on Instagram. It's a clean and simple way to show your product in a lifestyle setting, without impacting the user experience". However, there is a whole set of steps to follow in order to successfully feature your products in your feed. Below is a detailed how-to guide of implementing the new shopping experience step-by-step in order to make the most of the feature. Create a business account on Instagram. You can see how to do this on the Instagram official blog. Link your Instagram business account to your Facebook catalog. While Facebook offers a ready solution for integration with Shopify or BigCommerce, Magento can also be easily integrated with a Facebook catalog. You can do it either via API or by uploading the CVS files to Facebook. In the first case, you will need to go to your Facebook Business Manager and copy the token. Then, proceed to the Magento admin panel, enter the key and voila - Magento will synchronize the product catalog with Facebook catalog via the API. After that, while staying in Magento admin panel, simply choose the products you wish to be displayed on Facebook and that’s it. In the second case, you will need a module that will generate data feeds from your online store. These feeds come in many formats, but Facebook accepts CVS only, so you may need to convert them. You will then need to upload the CVS files to Facebook - this can be done either by a Magento development team or a third-party company. As for the module, it can also be developed by a Magento team or a third-party company. Get approved as a business profile. You will be approved if you have successfully completed the steps above. Update your Instagram to the latest version. Select the product catalog. Products from this catalog will be tagged in your photos. Note: If you don’t see "Shopping" in the settings menu, it means the account is either under review (it may take a few days or longer) or was not approved. After you’ve completed these steps, you will be ready to tag the products in your photos. Statistics by 99firms revealed that approximately 300 million users actively use Instagram Stories on a daily basis and 20% of Stories posted by businesses lead the user to a direct interaction with the brand. 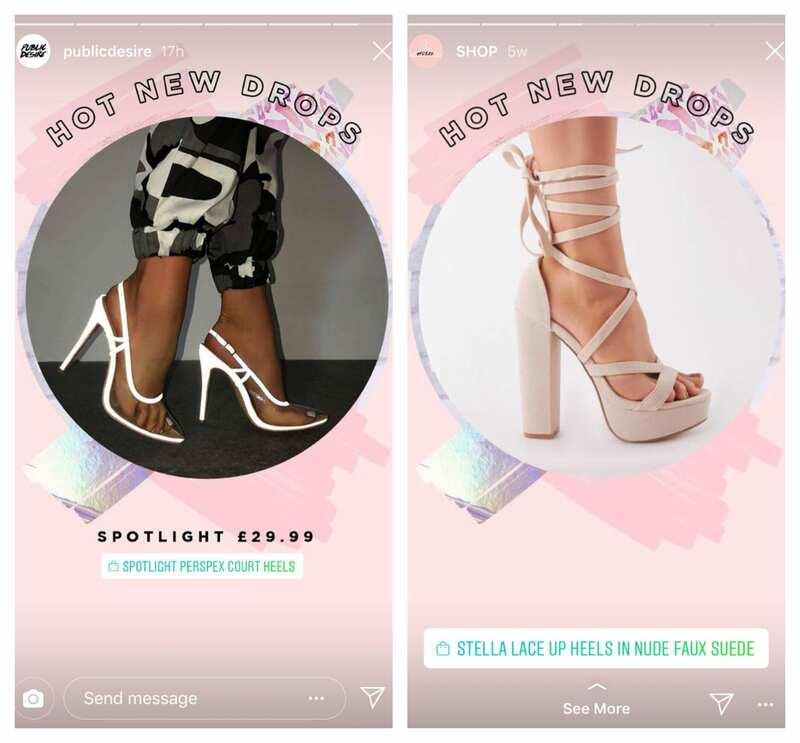 Taking this data into consideration, it came as no surprise that Instagram added a shopping feature to Stories, giving the brands more freedom in action and promotion. Product Stickers are located in the same place as GIFs or other stickers are. When the user taps on the sticker, they will be redirected to the pop-up page (in Instagram) with more product photos, a description and a link to the website. Create a business account on Instagram if you don’t have one yet. Get your account verified as described above. Being at the testing stage, this feature may become the next big thing for e-commerce businesses for better audience reach and sales increase. The Explore Section in Instagram shows you content that you might be interested in, according to your preferences. At the top of the section are topic channels, i.e. beauty, travels, sport, food, etc. that were introduced this summer. Now Instagram is testing the "Shopping" channel, which is displayed to the users who previously showed interest in Instagram shopping. The channel, just as with the others, will be tailored to a user’s interests and needs. Though only currently a pilot, this feature looks promising and may bring a lot of benefits to businesses. It would allow users to explore new brands and shop immediately while not being too heavy on advertising or interfering with a user’s activity on Instagram. In 2018, Instagram is the sixth most popular social network globally, according to Statista. As the number of its users continues to grow at a rapid pace, e-commerce businesses should try and adopt all the new features Instagram offers in order to retain their existing customers and attract new ones in an unobtrusive yet efficient and persuasive manner. Irina Linnik a marketing specialist at Onilab - a Magento troubleshooting company. Being a savvy e-commerce observer she always keeps abreast of innovation and covers the latest industry trends. Her goal is to inform the readers in a clear, understandable and enjoyable manner and help them navigate through the vast and ever-changing business environment. Irina has over 5 years of experience in freelance writing and has helped numerous companies communicate their message across various channels.